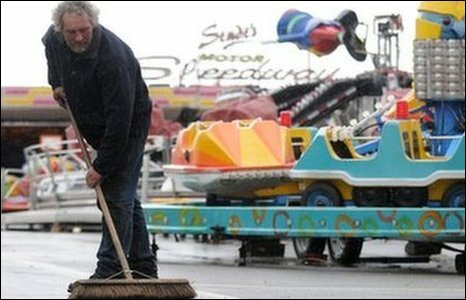 A seaside fair threatened with closure after a drop in visitor numbers is to reopen after new tenants were found. Barry Island's Pleasure Park, which features in the BBC comedy Gavin and Stacey, is being taken over by well-known funfair family, the Studts. 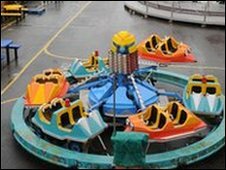 They have agreed a deal with the owner of the theme park to run it for a year and have spent the last month replacing old equipment and rides. Poor weather conditions over recent summers had led to a drop in visitors. "We are just trying to get it operational for Easter and will improve it as the season progresses," said Vernon Studt. "There's a huge amount of history here and it's good to be open." Not all of the park will be open, however. 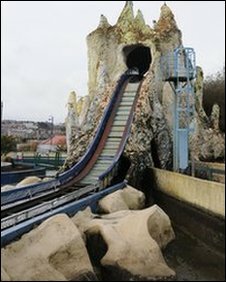 The log flume remains closed because it is not in working order. Mr Studt said: "We only agreed a deal a month ago. Since then I've been getting colleagues organised to get it up and running for Easter. "Hopefully the park will be completely up and running by July or August." Barry Island has struggled to attract visitors for several years, and last year was forced to close during the summer because of bad weather. The owner of the pleasure park, Ian Rogers, has long-term plans to turn the land into a complex of restaurants and attractions, with a 25-storey glass tower as its centrepiece. Mr Studt said the park would offer "something for the average family man and two kids to come here and spend a happy two hours". Up and running in the park will be a rollercoaster, dodgems, half a dozen children's rides and two "white knuckle" rides. Mr Studt said he was hoping the weather would be good for the bank holiday weekend. "Barry Island is the perfect place to be when there's good weather. But Good Friday is never the best of days." He said BBC comedy Gavin and Stacey, which was set in Barry and featured the Barry Island theme park, had been a huge boost. "Many of people now know about Barry Island, thanks to Gavin and Stacey," he said. Mr Studt's family has a long history of involvement with Barry Island. "I've been told by a local historian that the Studt family had a fairground on the sands at Barry in the 1880s. I'm a fourth generation of the Studt family involved in funfairs and in my nephew we have a fifth generation. "I have always been fascinated by Barry Island. I just hope we can do something and get the support of local people behind it." He added: "I am confident we can make it work here."